When converting over from old SCADA software to new SCADA software, the most important task has nothing to do with software or hardware – it has to do with people. A new SCADA system can’t reach its full potential until the people who use the system are both comfortable and confident in it. In other words, they have to be “converted” to the new SCADA software solution. Before people can fully embrace Ignition software — because of its innovative approach for HMI, SCADA and MES systems — they usually need to have a “conversion experience”. This moment happens when someone sees the amazing possibilities and benefits that Ignition’s powerful tool set can offer them in their work. It is the moment when the light bulb turns on and they realize that Ignition could change the way they do business. We are delighted to hear these stories on a daily basis from our customers. Henry Palechek is the Information and Process Control Supervisor for a large water district in California and has been working in the instrumentation field since 1986. Henry’s conversion story started a few years ago when he played a major role in converting the old SCADA system at the water plant where he works to a new Ignition SCADA system. “Because Ignition is designed to be open and SQL database-centric, I’m no longer limited by my SCADA software in what I can accomplish. “For example, in the past we wanted to know what the tank demand flow rate was. I have a flow meter at the pump station but under the old system the amount of the water being used by the system as demanded and the amount of water making it into the tank was unknown so there was no way to calculate this information. In the past, I was unable to perform this calculation either with my legacy SCADA software or PLC ladder, but now Ignition makes it possible. This flow rate is measured by seeing how much water is in the tanks now and in the recent past. By doing this we can compare the difference between the current tank lever and what it was 15 minutes ago to see how the flow rate of the water from that tank is being demanded. This information allows us to project tank levels in the future to see if we can keep up with the current demand of water flowing from our tanks. “But now with Ignition we can store historical data into SQL databases and I can easily query the database to get this information. “I can do this by comparing the past and current tanks level readings to create a volume over time signal that defines the flow rate. The result is displayed and stored as a database tag. “Being able to see our tank demand flow rate information in Ignition was essential to us back in September of 2011 when we experienced the Southwest blackout that covered Arizona, Southern California and Baja California. By using the tank demand signal, we were able to project when our tanks would be empty and we were able to move our emergency backup generator to supply power to our pump stations and meet the water demand. This experience added to Henry’s confidence in Ignition’s ability to help him solve problems today and in the future. Seeing data that was simply not accessible before helped him stay more informed to make sure that the needs of his water district were met. 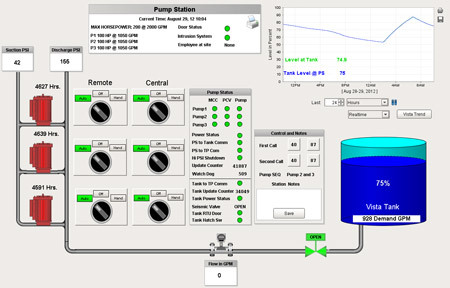 Converting to a new SCADA system like Ignition is a big step, but it’s one that’s worth taking. Ignition might just make a convert out of you too!